Last week we took a look at one of the more sought after beach and estuary species to grace the Sunshine Coast each winter in big schools - Pomatomus saltatrix or Tailor. The beach fishing for tailor article covered where to go along the Coast beaches, bait or lures, casting or trolling techniques and best rod/reel combos to get the job done. If you missed out last Friday and want to know more about beach fishing for tailor then check out the highlights on www.swanboathire.com.au This week we are sticking to the protected rivers and creeks to target the cheetah of the sea - with the comparison being about the speed and accuracy these two hunters have adopted, opposed to the likelihood that both species have whiskers and spots! River fishing is quite different to beach fishing. Not only are the tailor smaller in size but they are only going to be in the rivers and creeks if they have chased in a school of baitfish. The best way to identify a school of moving baitfish is to watch for sea birds circling as they too follow baitfish as a food source. The baitfish, especially herring, make a slight ripple on the water's surface as they move with the current and this often resembles ‘boiling' water. Casting lures or unweighted baits into these schools of bait is a classic tactic for having your bait hit by an unsuspecting tailor. Using baits such as WA, baby blue and large frogmouth pilchards is recommended. The best (and sometimes worst) part about using pilchards is, when attacked by a tailor the resulting head shakes and biting spread pieces of the pillie in the surrounding water. You are either happy with the natural burley release which is attracting more fish, or you will be cheesed off at the prospect of re-ganging yet another pillie! Unlike normal estuary fishing, where you wait in hope that a fish will smell your bait and have a nibble, lure or bait casting is the proactive way to attract the attention of a tailor. Both bait and lures can be ample in size as tailor can be extremely aggressive and regularly hit baits only centimetres smaller than themselves. So don't laugh at your mate who has just rigged a whole live mullet on his tailor rod. Line in the 4 to 6 kg range is all you will need in the rivers as average fish is in the 1-2kg weight range and you will have a good play with this breaking strain. Use gangs of 3 x 3/0 hooks with WA pilchards and smaller gangs of two or three with the smaller bait options. If planning to approach these schools by boat, it is also worth trolling feather jigs with sizable jigheads, metal slugs and even pilchard-like soft plastics. Poppers cast and retrieved as you walk along the bank of the river or slowly trolled behind the boat are also a big success. Kit yourself out with a Berkley Drop Shot 3-5kg weighted 6'6" rod with an Abu 802 Cardinal reel spooled up with 8lb Fireline joined to a 50cm plus of 30Lb leader. When the fish are in good numbers it pays to use a small length of wire above your hooks and lures. If you are in the market for a new rod for beach or estuary tailor fishing then before the end of this financial year is the best time to buy with many tackle stores readying for stocktaking. Swan Boat Hire is having a clearance on Surf Rods over the next two weeks with up to 20% of one and two piece rods. Just mention the code: Coastlife Surf Rod Special to staff and we will apply the discount. We can find a beach rod to suit all needs and are especially well practiced in tailor fishing! Next week being the first week of June, the focus will be getting prepared for the winter bream fishing season - this usually entails bribing your grandmother to knit a funky new beanie complete with a skull and crossbones to ward off the nasty flu lurgy and sharpening up your bait holder hooks in anticipation of a bumper winter fishing period. 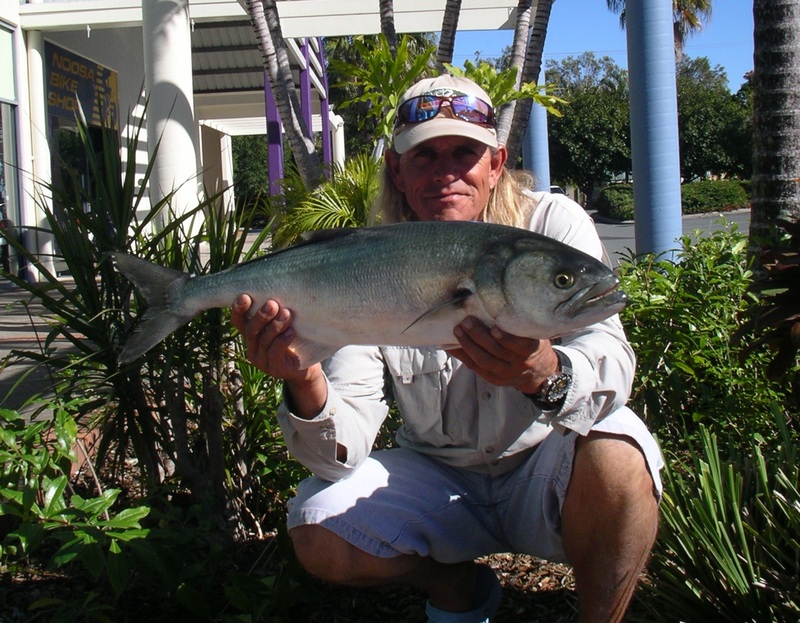 Noosa: Trevally and tailor in Woods bay and Munna Point in the mornings. Whiting on live yabby opposite Munna Point Caravan Park. Bream throughout the river. Maroochydore: Tailor along the beach over night at Mudjimba. Mud crabs in the channel between the motorway bridge and bli bli. Whiting between Chambers Island and the mouth on the morning making tide. 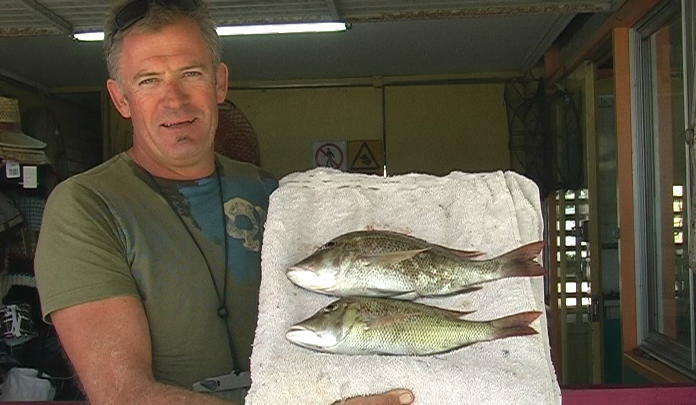 Kawana: Plenty of good sweetlip up to 2.5kg, snapper and parrot on the inshore reefs. Quality bream to 1.4kg from the canals. Gar in the sand basin. 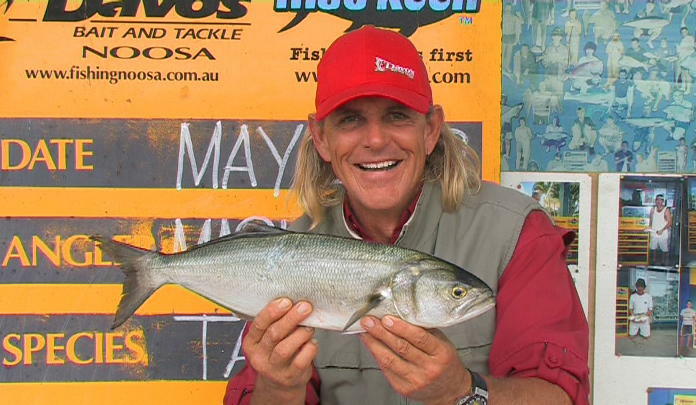 Caloundra: Quality bream around Gemeni Towers and the power boat club. Mud crabs at the Caloundra end of the passage. 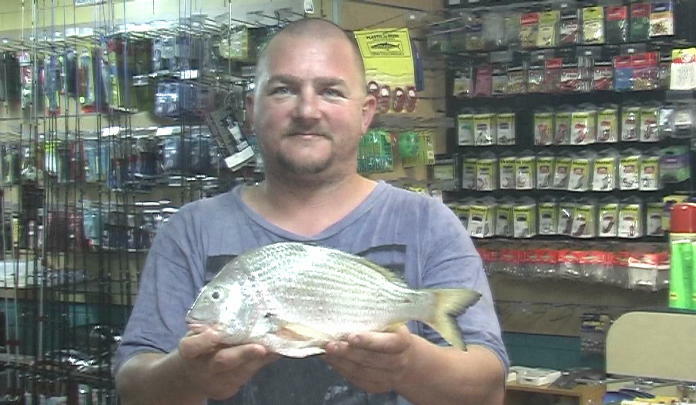 The pilot bream have started to show up on the Sunshine Coast with several fish up to 1.4kg taken in the Mooloolah River and this 945g specimen caught by David Smith using fresh mullet near Bli Bli bridge. Winter months generally give anglers in smaller boats a change to hammer the close inshore reefs. Andy Gunn ventured out to Old Women Island in his Tinny for these Spangled Emperors. Brento Mansfield was working small metal slugs through a bait school off old Women Island when this 6.2kg grey mackerel smashed it and put a up a great fight on light spin gear. The fish which terrorizes our beautiful surf gutters, dominates the deep channels of the estuaries on high tide and is also synonymous with speed and accuracy. That fish is the elite athlete of the sea – Pomatomus saltatrix or Tailor. Tailor a sleek, slick and slippery, with pale silvery green colourings along the back, silver on the belly and a distinctive forked tail. They grow to just over a meter in length and the biggest to top the scales that we know of was 14kg. They are well known for their large powerful jaws with sharp canine teeth and I will vouch for this after an incident where my sister almost lost her big toe while flicking lures for chopper tailor off the motorway bridge one Autumn. All I will say is her thong took a battering as Mr Chopper took a sizable mouthful of rubber only millimetres from her toe. Tailor dominate the surface water along Coastal Waters between Agnes Waters North Qld and Onslow in WA. Tailor come and go as conditions or food sources change, they travel in schools with the larger variety (green-backs) hanging along ocean beaches and the juveniles (choppers) entering estuaries in smaller schools. 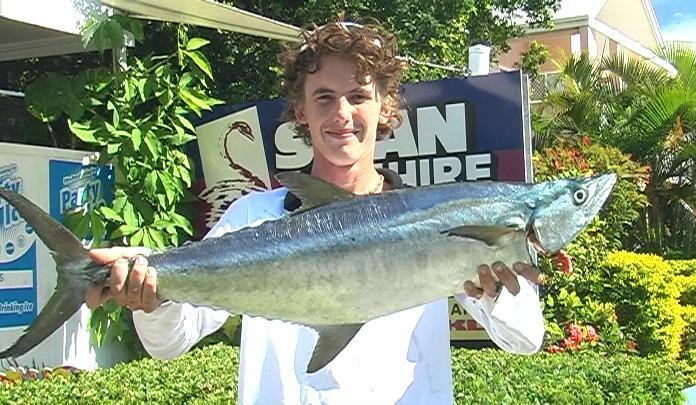 In Queensland the current minimum size for tailor is 30cm long and bag limits are set at 20 fish per angler. Next year the minimum size is increasing to 35cm on March 1, 2010. Tailor are very sought after by both your sporting angler and those of us who love to eat fish as they are one of the better tasting fish and also come with plenty of omega 3 oils! Be sure to bleed your fish on capture by breaking its neck. Boat anglers can catch tailor in the open ocean, but rocky headlands and ocean gutters, with plenty of white water on the outer edge are better spots. Dusk or early morning on a rising tide are excellent conditions but tailor can be caught through the day as well. So you are thinking that tailor sound like fun? Well choose where you would like to fish firstly and then gear up accordingly. Beach fishing is a great way to target both greenbacks and chopper tailor. Before venturing onto the beach with rod and bucket in hand, it’s wise to check out the surf conditions from a high vantage point. Observe how the waves are breaking, where the whitewash is forming and where the darker blue channels are. Gutters are where the fish will be moving. A gutter is recognised as a channel of deeper water, characterised by dark blue or green colours, and usually running parallel to the beach. Outer sand banks create gutters in front of them and as waves to break and make white wash the fish move freely as the white wash provides cover for them while also stirring up the sand and exposing food. Gutters are variable in length and can have an outlet back to the sea at one or both ends. The ideal gutters to look for are narrow and well within casting distance to reach the outer bank. An angler can simply cast over the gutter landing on the shallower waters of the sand bank, and then slowly retrieve the bait back through the deeper waters of the gutter. This technique is known as bait spinning and is best done with a whole fish bait coupled with as little lead as possible. Fish can often be found where a gutter empties to the sea. The surge of water in and out, stirs up the sand and smaller bait fish are in a frenzied feeding race, unaware that a tailor is about to hit it faster than an overloaded and faulty braked steam train coming down a mountain. It’s also worth keeping in mind that hard dumping waves are a sign that there is a sharp drop off which fish treat like a gutter by feeding along the edge of the drop off. It can be a bit harder to feel hits in these waves however. Pilchards and metal slug lures are ‘bait’ of choice when on the beach. Length of rod is important to gain the most ground in a cast. I can strongly recommend using the Wilson 13’6” Seacoaster or Wilson 12’ Heritage rod after many expeditions bringing happy tailor returns! These can be matched up with either an Alvey 700 model or a Surecatch Advance 570 Reel spooled up with 20lb mono and a meter of heavy mono or wire leader material. Once kitted up and standing in front of a nice deep gutter, you will need a long cast to the white water breaking at the back of the gutter. As the bait lands and you turn your reel around to the retrieve position, give the bait a short, sharp flick to pull the bait to the surface as though it is gasping for air. This often attracts feeding fish and initiates a strike. Keep the line tight and use a slow and steady retrieve, occasionally flicking the rod backwards to invoke a darting sensation in your bait. When a fish hits, you will feel distinct bite and a movement either towards you with your line suddenly going slack or it will head away from you and your line will sing to you as it zips out. Slackening line requires you to pull the rod upright to make sure the hook is set. Keep the rod high to take the weight of the fish. River fishing is quite different to beach fishing. Not only are the tailor smaller in size but they are only going to be in the rivers and creeks if they have chased in a school of baitfish. The best way to identify a school of moving baitfish is to watch for sea birds circling as they too follow baitfish as a food source. The baitfish, especially herring, make a slight ripple on the water’s surface as they move with the current and this often resembles ‘boiling’ water. Casting lures or unweighted baits into these schools of bait is a classic tactic for having your bait hit by an unsuspecting tailor. Unlike normal estuary fishing, where you wait in hope that a fish will smell your bait and have a nibble, lure or bait casting is the proactive way to attract the attention of a tailor. If planning to approach these schools by boat, it is also worth trolling feather jigs with sizable jigheads, metal slugs and even pilchard-like soft plastics. Poppers cast and retrieved as you walk along the bank of the river or slowly trolled behind the boat are also a big success. Kit yourself out with a Berkley Drop Shot 3-5kg weighted 6’6” rod with an Abu 802 Cardinal reel spooled up with 8lb Fireline joined to a 50cm plus of 30Lb leader. When the fish are in good numbers it pays to use a small length of wire above your hooks and lures. If you are in the market for a new rod for beach or estuary tailor fishing then before the end of this financial year is the best time to buy with many tackle stores readying for stocktaking. Swan Boat Hire is having a clearance on Surf Rods over the next two weeks with up to 20% of one and two piece rods. We can find a beach rod to suit all needs and are especially well practiced in tailor fishing! Noosa: Tailor and plenty of dart from within Noosa Sound and along the North Shore. A few big whiting in the frying pan. Flathead, bream and whiting from the Munna Point area. Trevally and chopper tailor in Woods Bay. Maroochydore: Flathead to 74cm and tailor to 72cm from the river mouth. Bream top 800g from Bli Bli over night. Plenty of sand crabs in the lower river. Trevally to 1.2kg from the Motorway Bridge pylons. Kawana: Chopper tailor from access 6. Gar in the river. Flathead and bream from around McKenzie’s Bridge. Sand crabs along La Balsa Park. Caloundra: bream and whiting from Currimundi. Queenfish and trevally in Pelican Waters Canal. Sand crabs from the Bar to the Power Boat Club. Chopper tailor in the bar. Paris and Daniel Connell fish from a Swan Hire Boat in the Maroochy River Cod Hole using fresh prawn for this quality grunter bream last weekend. Woods bay in the Noosa River is a great spot to target tailor on all forms of lure during the cooler months. Mark Arnall boated this 1.8kg specimen there last week. Darrin Hamilton of Swan Boat Hire was enjoying a day off from work in the Maroochy River when he stumble across a school of giant trevally around the motorway bridge pylons. 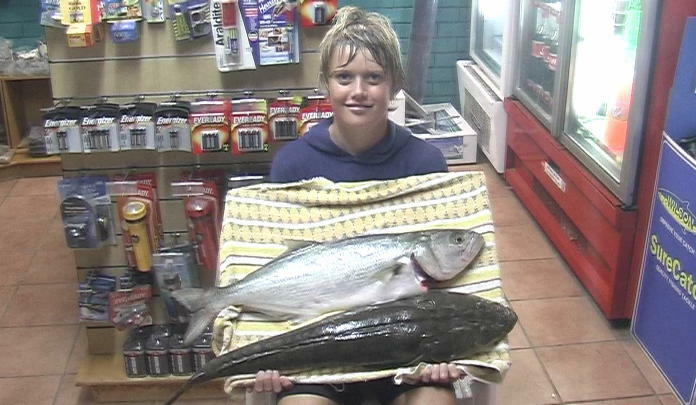 Jake Dale was fishing in the rain from the Maroochy River mouth using mullet for bait when he snagged a 74cm dusky flathead and 72cm tailor for his efforts. After Wayne Swan delivered a killer budget this week and the ‘R' word still being dropped in conversations all over the country, there is bound to be a few disgruntled people who will now have to start tightening their belts. Perhaps your other half has just informed you that in order to make ends meet this year there will have to be some big sacrifices on your behalf. Maybe you're finding it necessary to work more and more to fund your recreation and relaxation activities. Or do you feel like it is time to start saving up for the big purchase of a new car or boat? Well this week we are going to see how we can cut down on costs in the department of fishing without squeezing your passion right out of your life...much to your mother's/girlfriend's/wife's dismay! Fishing historically has been a cheap activity - you just have to look at evidence of our ancestors using sticks, bones and twine to land a big one. Over time technology has played a major role in the way we fish, what tackle we use, how we find fish and even the manner in which we document our angling prowess has become hi tech and expensive! Here are a few easy-to-follow steps for recession-proofing our much loved national hobby: fishing! It's been proven that you don't have to own the most expensive rod and reel to catch the big fish. The best way to get value for money in any rod and reel is to make a purchase which fits your budget and then take proper care of your investment. The saying "Nothing lasts as long as it used to" is frequently heard in tackle stores when anglers come in looking for a new product after their last reel only made a year's worth of fishing trips. Store your rod in a safe place, high enough so it's out of reach of tiny hands. Wipe down your rod after each fish as salt degrades to resin and epoxy which runners and tips are attached with. A rod bag or tube will also lengthen the life of your rod. If you do happen to snap off a tip or break a runner - all is not lost! For only a few dollars you can buy a replacement tip and many tackle stores will help you glue it back on, or there are also Rod Repairers who professionally replace tips or runners for around ten dollars and you'd never be able to tell the difference. 2. Apply a product like Lanox (similar to WD40 but enriched with lanolin) to the crank/gears to keep the mechanism well oiled and lubricated. This will protect the reel from the elements and salt corrosion until your next trip. 3. Service your reel at least twice a year - this involves unscrewing the spool and giving the area a good clean and lube up. Also take off the handle, clean and lube as well. You will be surprised the amount of dirt, sand and sometimes line that can be caught in these areas, ultimately leading to corrosion and having the mechanism seize up! If you are not sure about pulling apart your reel for fear of putting it all back together properly, take it down to a local tackle store for assistance or get out the manual for reference. Hooks, sinkers and swivels may be relatively inexpensive when bought in small quantities but over a year you may find you have purchased quite a bit. Buying in bulk requires bigger commitment of funds initially but in the long run each hook or sinker is individually much cheaper. To get the most out of hooks, get yourself a hook sharpening stone - they're less than $5.00 and they can sharpen up dull and blunt hooks as good as new in only seconds of sharpening. Keeping swivels dry and out of the salt will prolong their life - I make sure they are dry in my tackle box before putting it away in the garage. Only take a handful of swivels out with you and put the rest into a glass jam jar in your garage for safe keeping. I am a firm believer in being self sufficient wherever possible...bait included! The best free option is pippies-requiring little more effort than some bending over and digging with your hand. The best places these days for Pippies include the NE tip of Bribie, Yaroomba, the more secluded beaches in Noosa National Park and North Shore to Double Island. Pippies are mainly used in surf gutters, by placing a whole Pippy on the hook to target whiting, dart, bream and occasionally tailor. You can even eat pippies - I have tried Barbequed Pippy Kilpatrick back in the day when my family lived on Fraser Island. While sand worms are great bait, they're highly elusive and extremely hard to catch. Very few local beaches have sand worm populations anymore due to overdigging. Many locals have found success from self-dug bloodworms from up in the mangrove areas of the Noosa, Maroochy and Mooloolah Rivers. However, garden worms are a cheap alternative also. If you have received your stimulus money, paid all your bills and have a little left over then I can suggest making the investment of purchasing a cast net. Cast nets, provided they are rinsed after use and stored well, will last for many years. They are the essential element for the live bait angler and virtually pay for themselves within ten fishing trips or equivalent of ten packets of 200 gram prawn bait. Both herring and prawns are easily caught in cast nets as they move up and down the river systems on a high tide in large schools. Cast netting is a skill you learn which will stick with you a lifetime. The best option is to have a fellow angler or someone in the industry demonstrate for you. Once you have the knack and start catching prawns, herring and even little poddy mullet, you can target anything from big flathead and trevally to jew and tailor. With these species; the livelier the bait, the better your chance. I also have a few suggestions that locals have mentioned over the years for keeping costs down. If you are a boat owner, make sure you fill your petrol tank on Tuesday's to get the cheapest fuel or get your mates to chip in for petrol when they come along for the trip. Rather than buying small amounts of bait, go halves with a friend and that way you can buy a large amount for less. Don't throw away any old bait - the smelliest prawns make the sweetest tasting burley to fish and that way you won't feel the need to buy burley pellets. If you get in a pinch; bream and flathead don't mind bacon rind, beef gristle or chicken skin! Try walking or even break out your old bicycle to head to your favourite spot - at least you won't have to find a park. Don't be afraid to vamp up a worn-out soft plastic by soaking it in a bowl of tuna oil or aniseed. To improve the oil absorbancy prick the soft plastic with a pin. Every little bit counts, especially at present when so many individuals, families, businesses and communities are feeling financial difficulty. Wouldn't it be great if the things we enjoyed most were not affected by budgets and the credit crunch? At least some of the abovementioned suggestions may ease the burning sensation at your hip pocket for a little while. Noosa: Coral trout and sweetlip caught at Sunshine Reef earlier this week - worth a try this weekend Tailor, bream and dart along the Noosa North Shore. Flathead taking lures and bream on the incoming tide between the river mouth and Munna Bridge. Trevally in Woods Bay and around Goat Island. Maroochy: Dart and tarwhine during the day and a few tailor at night along Mudjimba and North Shore beaches. Gar and bream between the Twin Waters Weir and Chambers Island. Chopper tailor in the Cod Hole. Whiting, bream and grunter bream near Bli Bli bridge. Mud crabs in Eudlo Creek. Kawana: Sweetlip, squire and snapper to 3kg on both Gneerings the past few days. Dart and tailor along the beaches, best near the Kawana Surf Club. Bream and trevally along the bank at La Balsa Park. Schools of gar along with a few whiting near the Coast Guard Jetty. Caloundra: Chopper tailor and dart along the southern end of Currimundi beach. Squire, bream and chopper tailor in the bar. Jew in the deep holes and channels of the Passage. A few flathead off the Boardwalk and in Coochin Creek entrance. 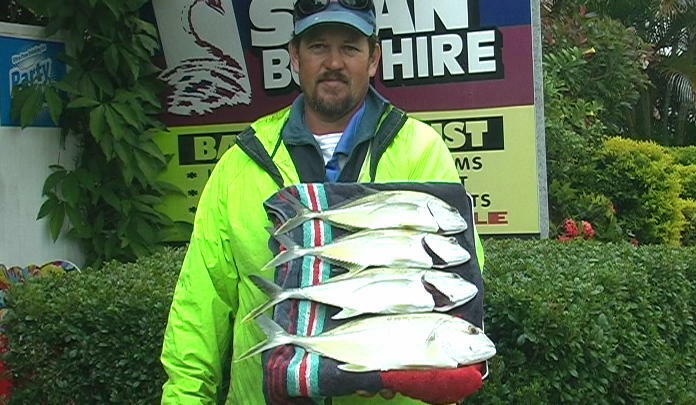 Allen Morgan and Andy Gunn hit Mudjimba Island early in the day for this feed of squire, yellowfinn tuna and parrot. 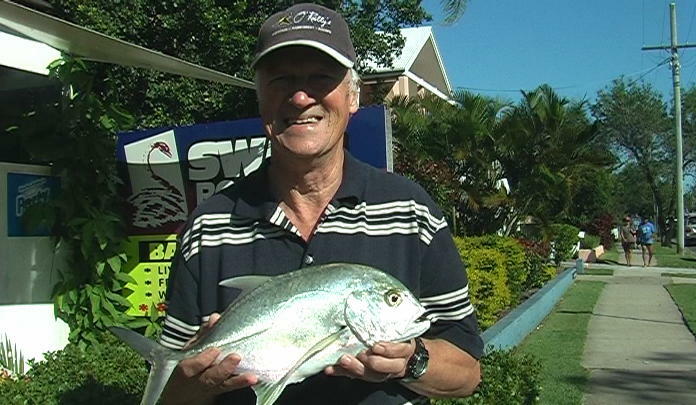 Kevin Boucher fished for this glistening trevally at his favourite position at Yinni Street. 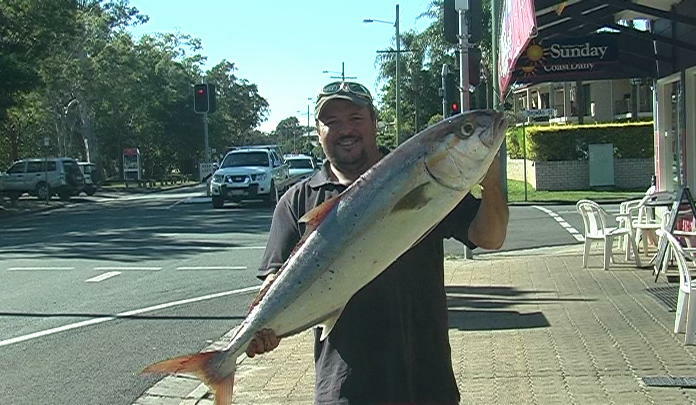 Robert Polzin struggled to hold up this beautiful 15kg amberjack caught on a recent trip to Mudjimba Island. Lucy Graham was grinning from winning! Two big muddies from her pots in Eudlo Creek. Although winter is still a month away, the telltale signs are apparent that the offshore winter fishing season has arrived. The crisp South-Easterlies blowing, cold mornings followed by mild sunny afternoons and freezing cold nights - this is one way to tell. Also the beanie to cap ratio is on the steady increase, notably at the boat ramps pre-dawn and dusk. But more importantly the most obvious clue is when the most targeted winter specie starts getting weighed in at bait and tackle store - and that fish is snapper! The best indication of a good, great or sensational winter offshore season is how many and how heavy the snapper are. Winters come and go with records getting broken over South-East Queensland as well as the tales of the ones which got away. Many anglers just like to be part of the snapper fishing action, so today we'll look at some of the bait and burley techniques, where and when to go as well as a few tackle hints. Snapper are said to grow to at least 130cm and up to 19.5kg. Plus they can live to 15 years of age, but the average age they grace our coastline chasing food and to spawn is around 3 years of age. Adult snapper are bright pink, merging to silver over the belly. A young snapper or ‘squire' as they are commonly known as can be identified by the distinctive bright blue spots scattered over the upper sides of their bodies plus the absence of the bulbous hump or knob on their head. Basically, the older the fish the bigger the knob and the blue spots fade away. Caloundra: Try the Coffee Rock out from the northern tip of Bribie Island, Bray's Rock (only 500m north east of Kings Beach by the channel markers), Caloundra Wide and Currimundi Reef as well. Mooloolaba: Head out the bar and try the close inshore reefs, the Gneerings, Murphy's and Barwon Banks. Maroochy: Just outside of the bar to Old Woman Island or head north towards Arkwright Shoal and Coolum Reef. Noosa: You have the option of sitting in Laguna Bay and just ducking to Sunshine Reef, heading to Chardons, North Reef, The Hards and even up off Double Island is a great snapper ground. Snapper are obsessed with flesh baits. You can't get any better than fresh mullet fillets, bonito, slimy mackerel, yakka and pike fillets are also very good. Pilchards and squid are also great baits for snapper. Softer baits will easily be picked off your hooks by squire or grassy sweetlip feeding in the same area. Finely cut pilchards sent down in a solid burley trail for the first hour of fishing, followed with several small burst over the coming hours which help to bring the snapper in behind your boat. 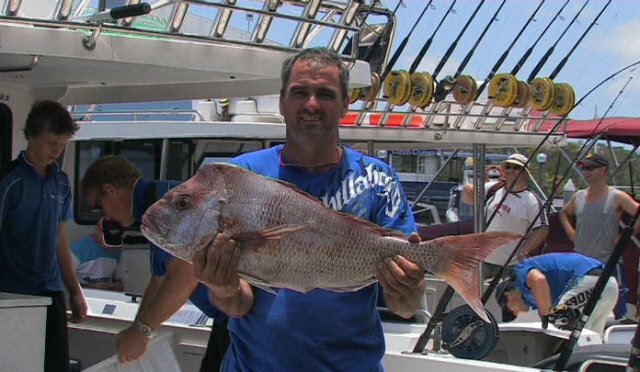 Snapper have the tendency to hit like a freight trains and generally run straight for the cover of the reef. Once hooked they'll use their large tail and deep body to fight like a thrashing machine. They love to swim back into the reef to find cover once hooked and this is why anglers need to fish for them with tighter drags and gutsy rods. They are renowned for their fight to the death attitude and you can rely on them to fight hard from the start right through until they are dragged into the boat. Once you feel weigh of the fish, lift the rod and hopefully you hook up, but often the fish will just let go of the bait. Your other option is to place your reel in free spool mode or use a bait runner style reel, so that the fish can pick the bait up in its lips and swim away without feeling too much resistance and then apply pressure to set the hook. It does pay to fish light lead with a set of ganged or snelled hooks on the local reefs to increase your chances of a hook up. Rigging several 5/0 to 7/0 hooks in a flesh bait, whole pilly or squid will not only hold the bait on better and present it more naturally, but more hooks means more chances of hooking the fish in the mouth. Small ball sinkers rigged above your hooks in a running style will allow the fish to pull line out on a run with minimal resistance. Snapper will often attack slow sinking bait on the way down, if it sinks slow enough and looks natural. Don't wait around too long if you're not having success - move or try a different bait. If they're going to bite, it will happen fairly quickly. It is vital you remember that snapper have to be 35cm or more in length to be of legal size, so it is generally not that hard to get a couple of keepers if you fish using the techniques discussed in this article. There is also a recent change to the bag limit for Queensland waters - now 5 snapper is the maximum. Noosa: Golden trevally, bream and whiting in the channel between the river mouth and Woods Bay. Flathead in Weyba Creek, the Tewantin stretch and between the Lakes. Good dart, bream and tarwhine along the North Shore. Maroochydore: Flathead taking lures and whitebait at the river mouth and off Chambers Island. Estuary cod, trevally and bream on the top of the tide at the Cod Hole. Chopper tailor heading into the river on the high tide. Dart and tarwhine along the beaches. Sweetlip and small snapper around Old Woman Island at night. Kawana: Chopper tailor, trevally and bream from the Point Cartwright Rocks. Tarwhine, whiting and dart along Kawana Beach. Bream and flathead in the upper reaches and Kawana Waters. Trevally and bream along the La Balsa Park reach. Gar and small snapper off the rock walls at night. Caloundra: Chopper tailor, flathead and bream inside the bar. Flathead around Military Jetty and the mangrove islands on the western side of Bribie. Whiting scattered throughout the Passage. Trevally and bream in Pelican Waters. Lucy Graham was tickled pink with this moses perch ans sweetlip from Old Woman Island. 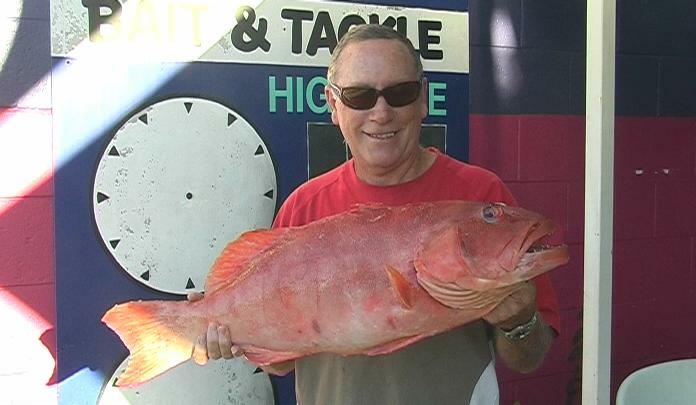 Rob Edmonds holds up a prize 5.8kg coral trout caught at Caloundra Wide on pilchard. 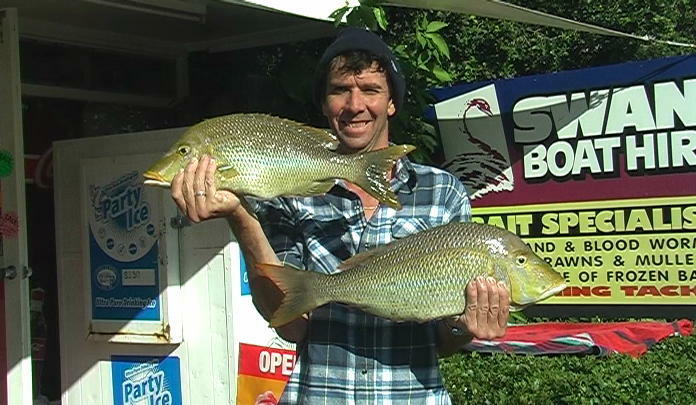 David was happy with two sweetlip for his dinner, caught just outside of the Maroochy bar. 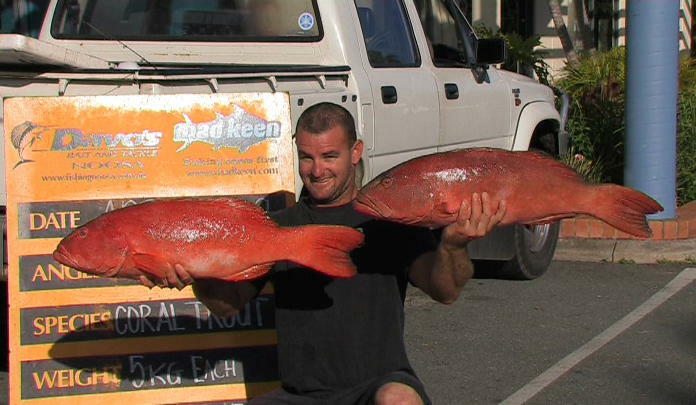 Sean White fished Noosa's Sunshine Reef for a gleeming 5kg coral trout last weekend. Mike holds up a 6kg snapper caught at Noosa's North Reef aboard Laguna Charters. 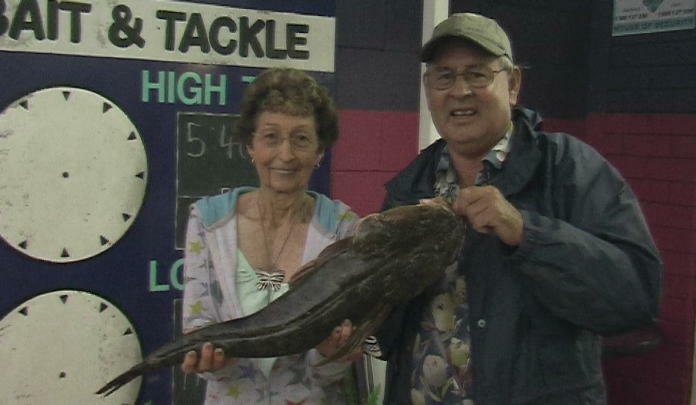 Daphne and Lester Horsman spent a romantic night out fishing at the river mouth and brought home a winner - a 2kg flathead! 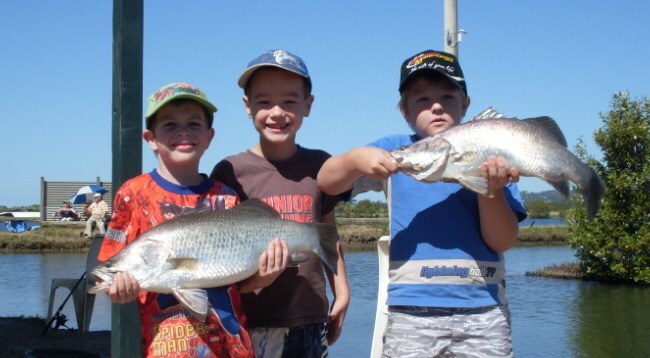 The annual Take a Kid Fishing day has snuck around the corner very quickly, as it seemed like not so long ago that Swan Boat Hire staff were spending some quality time mentoring our future anglers at the SunCoast Barra in May last year. 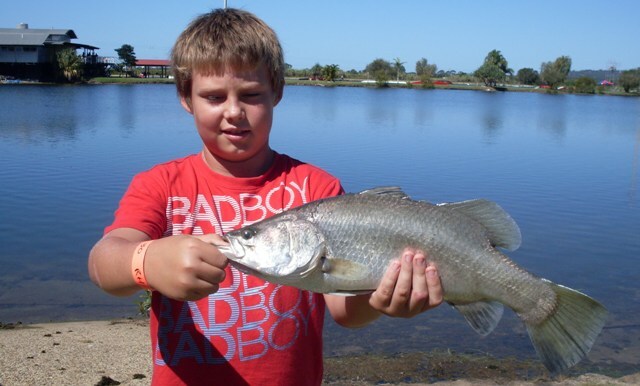 Take a Kid Fishing day has been an annual event for over 4 years after the Queensland Government assigned specific funding towards hosting an angler education event under the Lifestyle Fishing Program. However, Sunfish has been coordinating clinics and information sessions for young anglers for nearly thirty years. Thirty events have been spread statewide for the 2009 program, from the Gold Coast up to Mount Isa with places like Warwick and Ipswich holding freshwater events. Sunfish has confirmed that state government funding will make it possible for the program to be extended for the next three years. 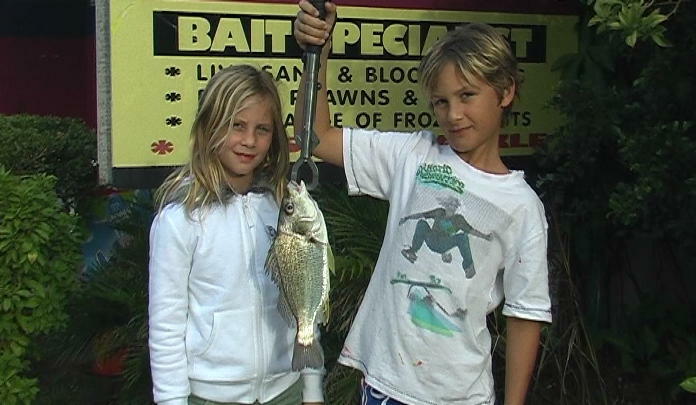 2009's Take a Kid Fishing day was bigger and better than ever, with many events hosted by local bait and tackle stores along the coastline from Caloundra to Noosa. Each event had a kitty of sample bags provided by SunFish to give away as well as a variety of prizes for attendants. The sample bags were bursting with goodies including a fishing DVD, suncream, the 2009 tide book, a poptop drink bottle, lots of brochures with information on fish identification and legal limits, and fishing magazines to read. 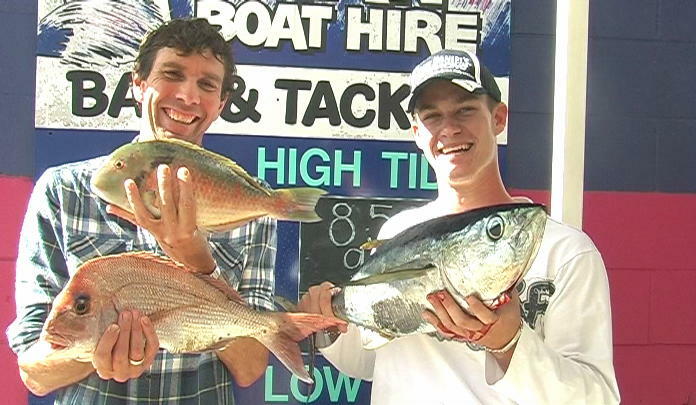 Davo's Bait and Tackle hosted an action-packed day in the Noosa area. Over 35 anglers visited Davo's on Sunday 26th April too begin the day. Here the young anglers were encouraged to bring in their rods and reels for a tune up, untangling and re-rigging. Davo's staff handed out sample bags and demonstrated to each angler the features and techniques for use with their rod, they were then sent to a good fishing spot on the river to wet a line. Plenty of bream and whiting were caught and brought back for measurement. Davo's Cheryl Lacey reported that the day was a huge success for angler education and it was very encouraging to see many first-time anglers showing interest in the sport. Davo's also handed out four $50 tackle vouchers to lucky local anglers drawn randomly from those who registered. In Maroochydore, the event was held also on Sunday 26th April at the SunCoast Barra Park for the second year running. The Barra Park on David Low Way is an excellent location with a healthy attendance rate of 40 young anglers who registered early on who also brought parents and grandparents along. Swan Boat Hire and SunCoast Barra Park staff had demonstrations on correct rigging and care of your fishing gear, how to measure your catch and landing your fish methods. The mixed catch from the three ponds within the Barramundi Park included bream, flathead and plenty of barramundi to go around. Sample bags were given out to every child attending and Swan Boat Hire also donated 4 Estuary Rod and Reel combos, 12 kayak hires, 2 Runabout boat hires, lures and a variety of flathead and bream tackle packs as lucky draw prizes. As usual every child received a prize and the day was topped off with a free sausage sizzle to warm the insides. Dave from SunCoast Barra Park was very impressed at the turn out this year and commented on how positive it was to see three generations in many families at the event. He also reported that the numbers of catch and release barramundi were very impressive this year. 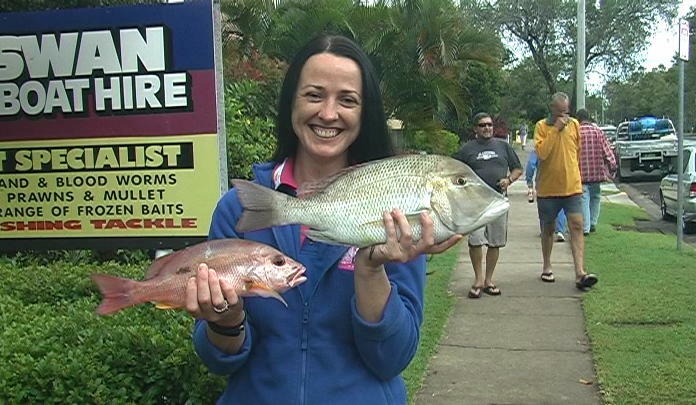 The Caloundra Power Boat Fishing Club reported a new record for Caloundra's Take A Kid Fishing Day this year. After last year's roll up of seventy-eight kids, the fishing club set themselves a target of attracting one hundred kids to come and enjoy a morning learning a little about our marine life and environment. When the first parents arrived at 7.15am with their kids to register, they knew they were in for a big day. By 11am they had registered one hundred and thirty-four kids, who also brought with their parents and grand parents, making the Esplanade at Golden Beach look quite impressive with in excess of four hundred people fishing and relaxing. Two DPI & F officers, Robbie and Ashleigh, came along for the day and spent time on the beach talking with the kids and parents explaining some of the new fishing and bag limit rules and stayed well after the presentations, mixing with the people answering many questions. Deputy Mayor and Division 3 Councillor, Tim Dwyer congratulated the Caloundra Power Boat Fishing Club on its involvement in promoting fishing as a great family day out. Caloundra Powerboat Club president Barry Purcell reported that a brilliant day was had by all and he applauded the efforts from the twenty-eight fishing club members who gave of their time on the day pumping well in excess of one thousand yabbies (not a single one left over), walking the beach giving well received advice, cooking the sausages, registering the eager kids, taking some great photos, measuring the fish and many other little jobs. All agreed the day was an undoubted rewarding experience and will definitely be part of next year's Take a Kid Fishing Day promotion. As you can see, Take a Kid Fishing Day 2009 was a well planned, positive day all over the Sunshine Coast. Without the support of local fishing clubs and tackle stores, this wonderful day would not be possible. Remember to keep your eyes peeled for next year's event which will most likely be in May. And don't forget to fish for the future and only keep what you need! Noosa: Bream, big tarwhine, whiting and dart between North Shore's first cutting and Teewah. Chopper tailor and trevally in the lower reaches and near the Sheraton. Plenty of bream in the lower reaches. Bream and flathead in Weyba Creek and off Munna Point. Still mud crabs getting potted throughout the lower reaches. Maroochydore: Dart and tarwhine between Marcoola and Mudjimba beaches. Good bream at night upstream from the Cod Hole and plenty of average bream off Chambers Island and the jetty near Duporth tavern. Whiting and a few flathead around Twin Waters weir and Godfreys Rd. Good mud crabs in the creeks. Kawana: Plenty of dart along Wurtulla and Kawana beaches. Bream and trevally off the rock walls at the bar. Reports of gar and the odd blue swimmer in the sand basin. Whiting and flathead along La Balsa Park. 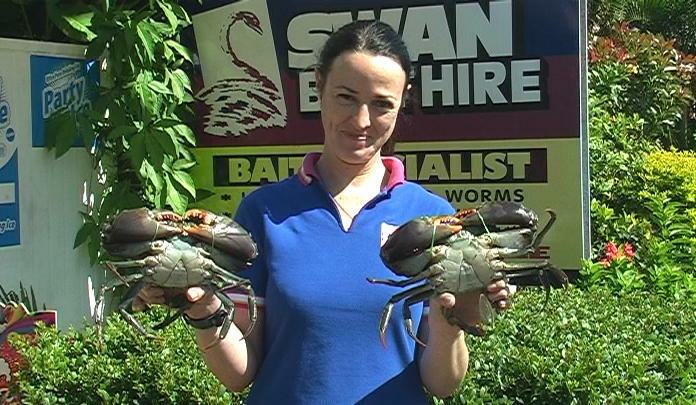 Mud crabs in Kawana Waters and Mooloolah river stretch. Caloundra: Bream, trevally and flathead along the Boardwalk and near the Power Boat Club. Sand whiting in teh surf along Bribie and towards "The Skids". Mangrove jack and estuary cod in Pelican Waters Canals and mud crabs in the creeks. Alec, Lachlan and Travis with 2 barramundi at the Maroochydore TAKF day. Brandon Rich was thrilled with this 3kg barramundi caught at TAKF day. 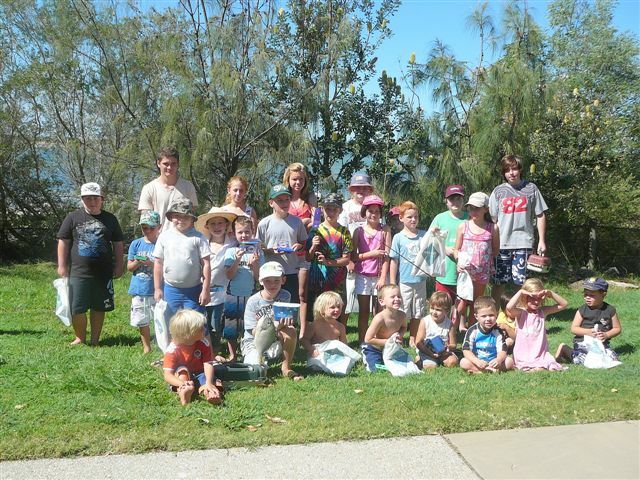 The results of a good morning of fishing at Caloundra, young anglers proudly show off their catches from TAKF day. 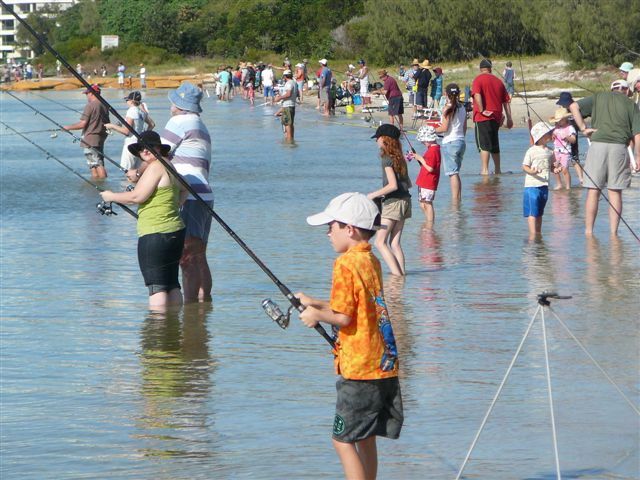 Golden Beach foreshore was scattered with eager anglers all taking part in Take a Kid Fishing day at Caloundra. 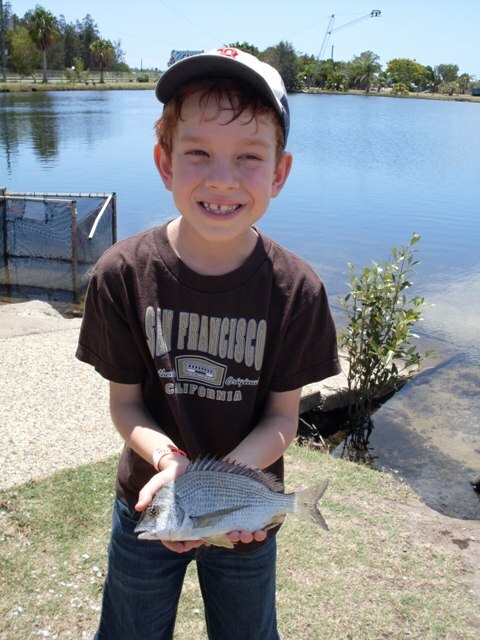 Jack McLennan displaying a nice bream caught in the mixed species pond at SunCoast Barra Park on TAKF day 2009. 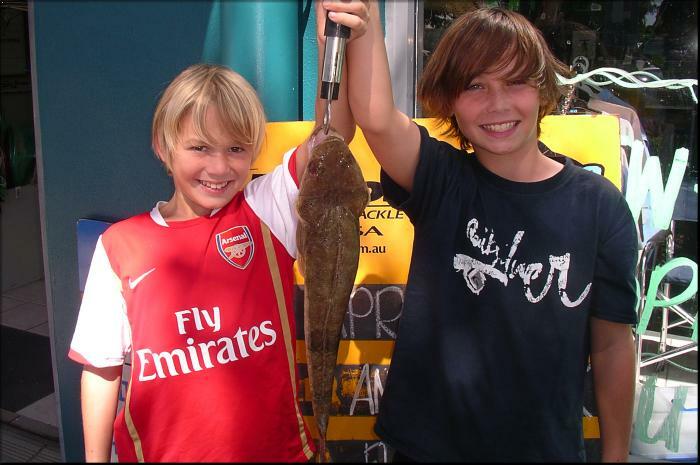 Mates Angus and Jack show off their flathead from Munna Point, caught after spending time at Davo's for TAKF day. 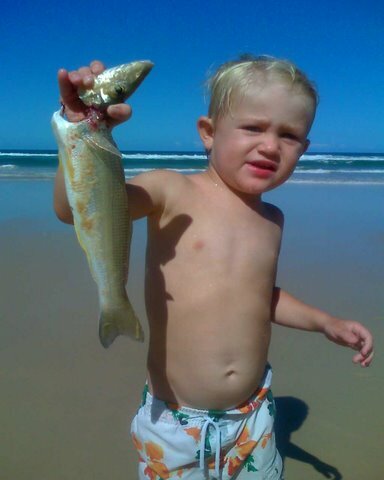 Young Marley Steiner headed to Noosa's North Shore for TAKF day and caught this quality whiting.